6/1 Cup of Coffee: Last night's action on the farm was marked by late-inning heroics, as Pawtucket and Salem both scored the game-winning tallies in the eighth inning or later, including a walk-off win at McCoy Stadium. While the top three affiliates were on the winning side of close games, the Greenville Drive were not as fortunate, falling in 12 innings. The PawSox offense, aided by five errors, exploded for 12 hits and nine runs in Friday's 9-8 win over Syracuse in 12 innings at McCoy Stadium. The attack was led by nine-hole hitter Jonathan Diaz (pictured), who was 3 for 4 with two RBI and two doubles, which included the game-winning run in the bottom of the 12th. To lead off the frame, second baseman Justin Henry reached base on an error. Following a sacrifice bunt and an intentional walk, Diaz doubled home Henry for the walk-off win. With the PawSox trailing 8-6 going into the bottom of the eighth, first baseman Drew Sutton tied the game on a one-out, two-run home run over the right field fence. Starting pitcher Chris Hernandez dug the PawSox in an early hole, surrendering three earned runs in the first inning. The left-hander settled down, giving up only one more unearned run for the remainder of his five innings of work. Relievers Anthony Carter, Jose De La Torre and Ryan Rowland-Smith each pitched one hitless inning of relief in extra innings. The Sea Dogs were the only affiliate whose game was not decided in the late innings, as they prevailed 7-3 over the Altoona Curve (PIT). The Sea Dogs were led at the plate by designated hitter and top prospect Xander Bogaerts, who slugged his fifth home run of the season in the contest's eighth inning. Also going deep for Portland was leadoff hitter Shannon Wilkerson. Wilkerson stole a base in the contest too, his 12th of the season. Portland starter Charlie Haegar picked up the win for Sea Dogs, his second of the season. Haegar, 29, gave up two earned runs in 6 1/3 innings pitched, bringing his ERA to 3.79. The Salem Red Sox gutted out a 3-2 victory over the Myrtle Beach Pelicans (TEX) on the strength of an eighth-inning bases loaded RBI single from Henry Ramos. The game was knotted up entering the eighth inning. Following a lead off walk of center fielder Keury De La Cruz, Brandon Jacobs poked a single to left field. Catcher Blake Swihart's walk loaded the bases for Ramos, who singled to left, scoring De La Cruz. Although he doesn't have a win to show for it, Salem starter Henry Owens had an impressive day on the mound. In six innings pitched, Owens struck out seven batters and only allowed one run on two hits. The left-hander's ERA on the season stands at 3.53, and he is currently second in the Carolina League with 62 strikeouts for the season. Like in Pawtucket, fans in Greenville were treated to bonus baseball, but with a less than favorable result, as the Drive fell to the Asheville Tourists (COL) by a score of 3-2 in 12 innings. Greenville starter Austin Maddox was strong in five innings of work, giving up only one earned run. However, more impressive was reliever Francisco Taveras, who pitched seven innings in relief. Taveras, who got saddled with the loss, gave up only one earned run and struck out six batters. Although the Drive were able to string together 11 hits, it did not translate into production on the scoreboard. Shortstop Jose Vinicio and third baseman Mario Martinez each picked up a RBI for the Drive. Second baseman Mookie Betts continued his torrid hitting pace, collecting two hits, both doubles, in the loss. 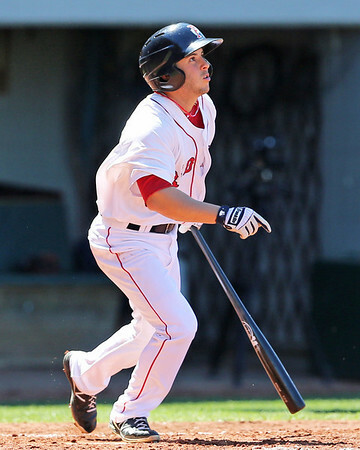 Betts, 20, hit .359 in the month of May with six home runs. Player of the Day: Top organizational prospect Xander Bogaerts displayed both patience and power at the plate in Friday’s win over Altoona. Bogaerts, 20, went 1 for 3 with a walk and a two-run home run. On the season, Bogaerts is hitting .290 with five home runs and 30 RBI. Photo Credit: Jonathan Diaz by Kelly O'Connor.